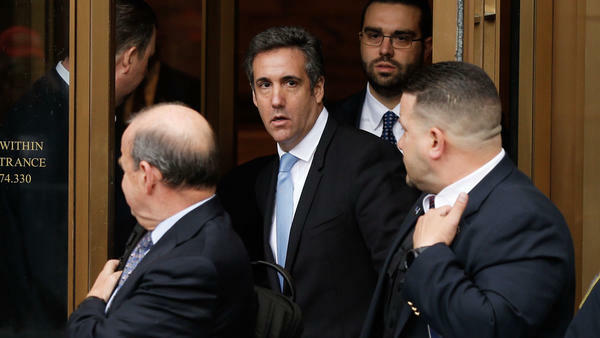 Michael Cohen leaves a federal courthouse in Manhattan on Monday, after a hearing about evidence seized during a raid of his home and office last week. Cohen has been under criminal investigation for months, according to court documents. President Trump's personal attorney, Michael Cohen, has dropped a pair of defamation lawsuits he filed after BuzzFeed News published the infamous Russia dossier last year. The embattled lawyer isn't conceding anything about the substance of what was detailed in the dossier, which is unverified, but says he has too much else on his plate to proceed now that he is dealing with a federal court case in New York. "The decision to voluntarily discontinue these cases was a difficult one," said a lawyer for Cohen, David Schwartz. Continued Schwartz: "We believe the defendants defamed my client, and vindicating Mr. Cohen's rights was — and still remains — important. But given the events that have unfolded, and the time, attention and resources needed to prosecute these matters, we have dismissed the matters, despite their merits." The FBI raided Cohen's home and office this month, and prosecutors with the U.S. Attorney's Office for the Southern District of New York revealed that they have been conducting a criminal investigation against him for months. Cohen has not been charged, but he is battling prosecutors over the cache of evidence the FBI seized. The Washington, D.C., private intelligence firm Fusion GPS responded on Thursday that Cohen's decision to drop his suit showed that he was unwilling to undergo the fact-finding that opens a lawsuit because of what it might reveal about him. "We welcome, though are not surprised, that Michael Cohen opted to withdraw this meritless complaint rather than face a discovery process that would have forced him to defend his reputation and address the allegations of the Steele dossier under penalty of perjury," the company said. "With his decision, it appears that Mr. Cohen can now focus on his many other legal travails." BuzzFeed News, which published an unexpurgated version of the dossier early last year, also welcomed Cohen's decision. The leaders of the conservative Washington Free Beacon commissioned Fusion GPS to research Trump during the Republican primaries. When their interest lapsed, the company approached the law firm of the Democratic National Committee, which began paying for the investigations. One result of that was Fusion GPS hiring a former British intelligence officer, Christopher Steele, to research Trump's relationships in Russia. Steele's reports about his research formed the infamous dossier, which has not been fully corroborated but which describes an alleged conspiracy between Trump's campaign for president and Russia's operation of interference and "active measures" against the 2016 election. Cohen plays an integral role, one he has stridently denied. The merits of the dossier are one of the hottest points of contention in the political battles over the Russia imbroglio. Republicans say it is a work of political agitprop that was irresponsibly used by "biased" Justice Department officials to abuse their surveillance powers. Democrats point out that the FBI has substantiated some parts of the dossier, but those details were redacted from a classified memo prepared by the minority on the House intelligence committee. McClatchy has reported that Justice Department special counsel Robert Mueller also has evidence about one key aspect of the dossier involving Cohen, but there has been no official comment about that from Mueller's office or the Justice Department.